DoubleTwist for Android enables the user to sync and play their iTunes podcasts, videos, playlists, and import ratings, and DoubleTwist continues to integrate the iOS platform into their Android application and has now updated said app. According to the guys over at Engadget, DoubleTwist has now updated their Android app to version 1.4 and now features AirPlay, which will enable users to stream music, images and video to Apple TV or other compatible mobile devices. 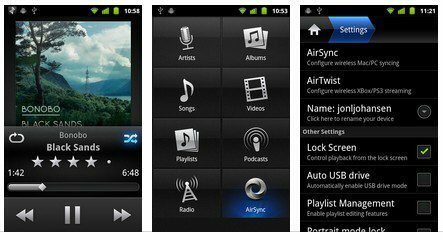 Although the DoubleTwist app for Android is a free app from the Android Market, those wishing to use the AirPlay feature will be required to purchase a $4.99 AirSync add-on which enables wireless syncing with your iTunes media library and streaming to uPnP compatible gear and DNLA. Here’s what’s new in DoubleTwist 1.4… AirPlay for users who have upgraded to AirSync, Beta support for Sonos, modified DoubleTwist settings, new About section and numerous bug fixes.